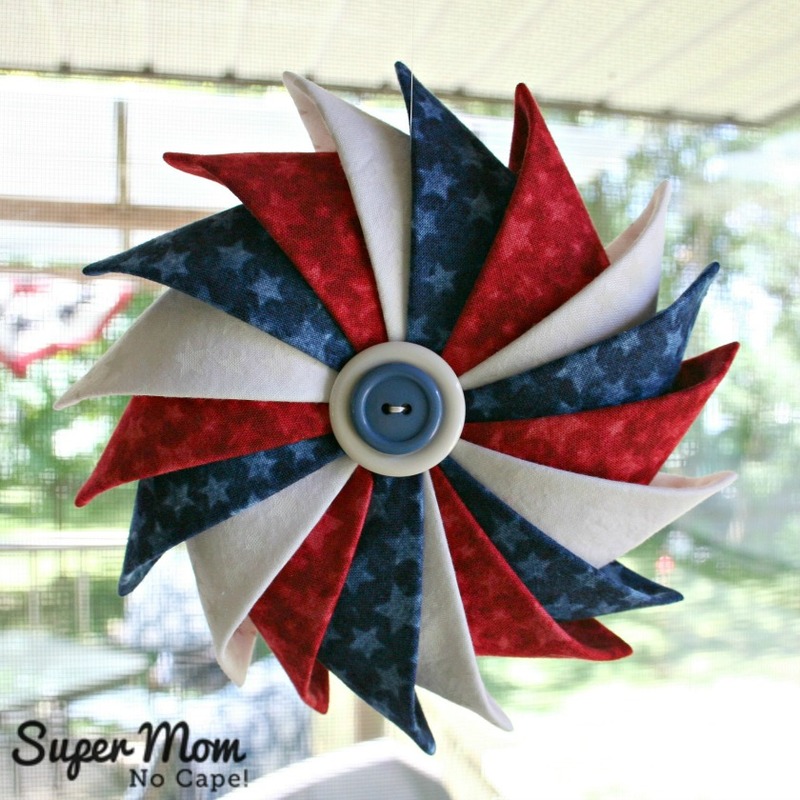 Are you looking for something new to add to your Memorial Day or 4th of July decor? 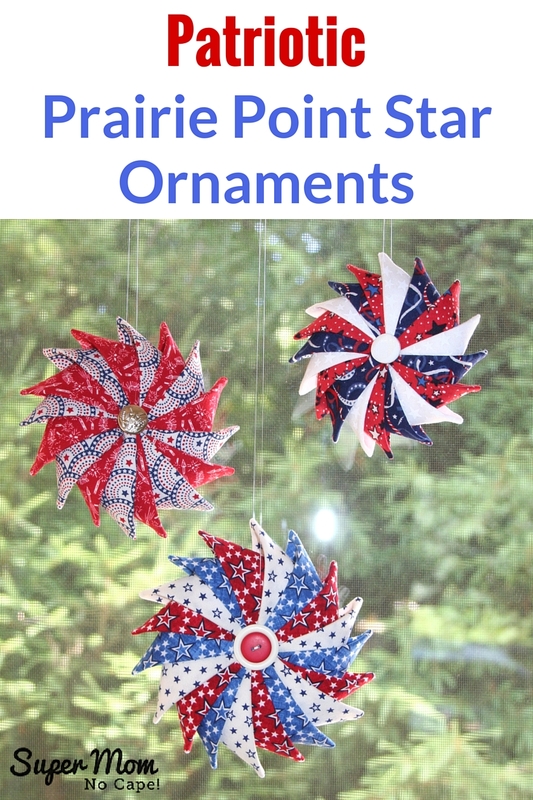 These Patriotic Prairie Point Star Ornaments will look beautiful hung in your windows or other places around the house. 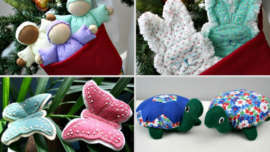 They’re made using my Prairie Point Star Ornament Tutorial that includes complete step-by-step instructions to make them in different sizes from 3½”, 4″ and 5″ squares. 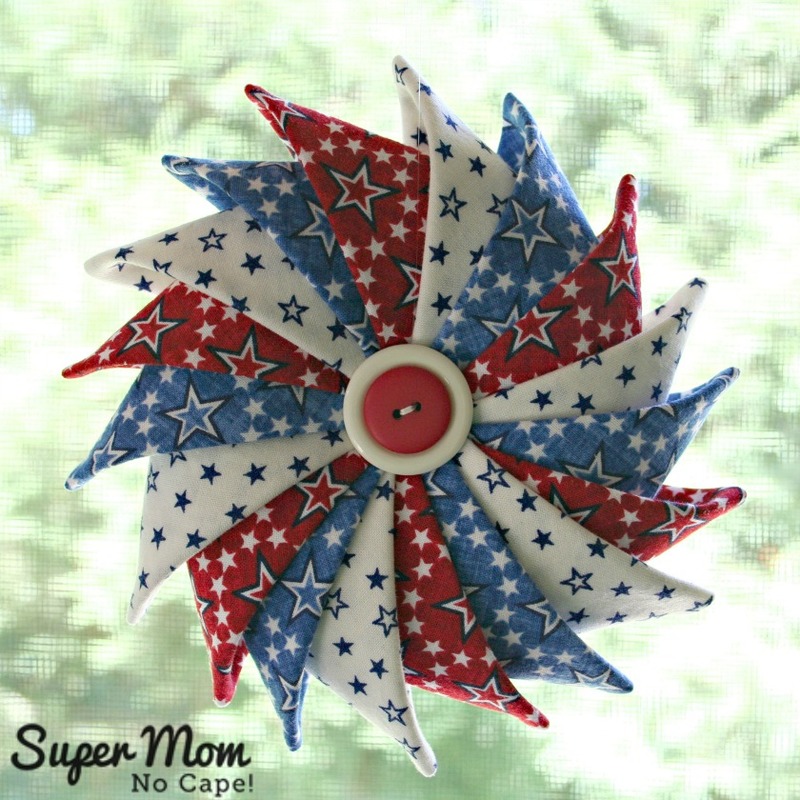 If you’ve got charm packs or yardage in stars and stripes themed fabrics in your stash, these Patriotic Prairie Point Star Ornaments are the perfect way to use them up and bring an extra special touch to your Independence Day decorations. The red star and the blue star fabrics in the ornament pictured below are from the fabric line American Anthem by StudioE. The blue stars on the white background are from Let’s Celebrate also by Studio E.
It was made by cutting 5″ squares to make the prairie points. The fireworks and star fabrics in the ornament below are more fabrics from Let’s Celebrate by Studio E cut into 4½ squares. 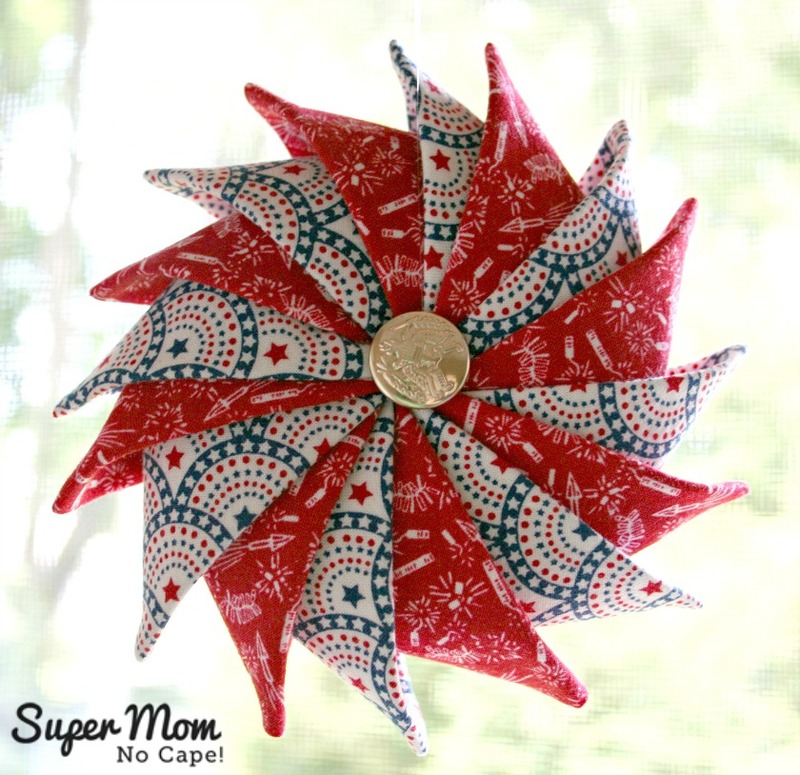 This 4″ Patriotic Prairie Point Star Ornament is made from fabric I purchased with coupons from Joann Fabrics. Once I started making these stars, I just couldn’t stop. So here’s a fourth one. The red and blue fabrics are Stonehenge Celebration 3 by Northcott. 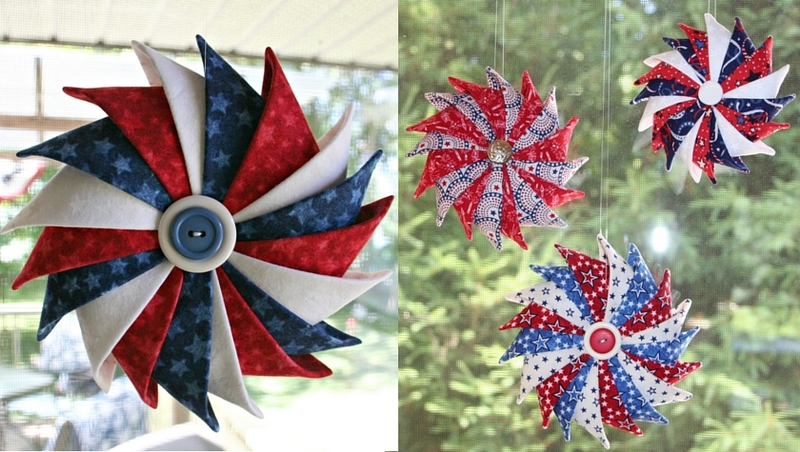 Want to make some Patriotic Prairie Point Star Ornaments for yourself or to give as gifts? You’ll find complete step-by-step instructions by clicking on the link below. Please note: For the stars with three different fabrics, I used 18 squares (6 of each fabric) rather than the 16 squares called for in the tutorial. And after you’ve made one (or more) Patriotic Prairie Point Star Ornaments be sure to blog about it or post it on Instagram, Flickr or Facebook, then come share it in my Prairie Point Star Ornament Link Party! Be sure to save these Patriotic Prairie Point Star Ornaments for future reference by clicking on the Pinterest button underneath this post. These stars are just great such a fun project and nice pieces to decorate with. Those are gorgeous in the RW&B. WOW they do look fabulous in the red, white and blue fabrics…. Gorgeous. 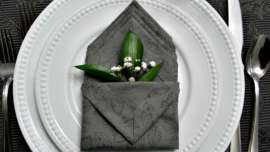 I have to find some time to make these. Love the ornaments…n between all my other projects…I am going to make these..may be Christmas ones before I get them done…..Thanks For Sharing?????? How beautiful they have turned out. 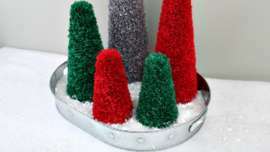 I will have to have a go at making some. These are just beautiful!! I clicked through to read how to do the stars and was very impressed by the refinished cabinet of the Singer sewing machine, so like my mother’s that I use all the time. I’d love to read about how the cabinet was refinished, if you have that history. Congratulations on having such a beautiful machine to work with! 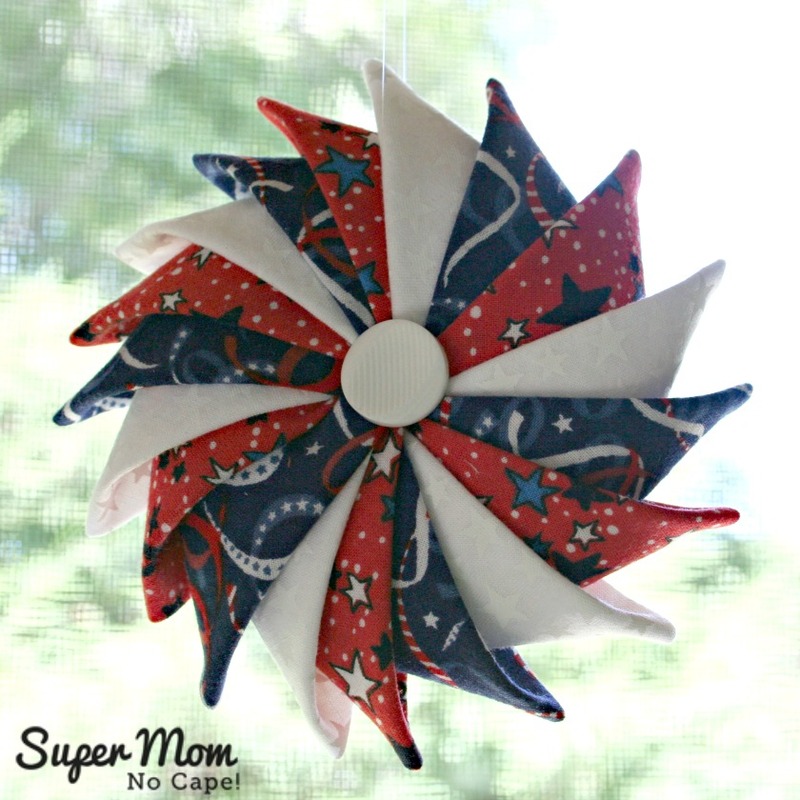 Your patriotic star ornaments look terrific! What a great way to show off some red, white, and blue. Thanks for sharing at Celebrate the USA Party. Pinning.